The Osaki OS-4D JP Premium massage chair breaks away from the Chinese and Korean made massage chairs and features Japanese design and manufacturing, along with a host of new technological improvements. 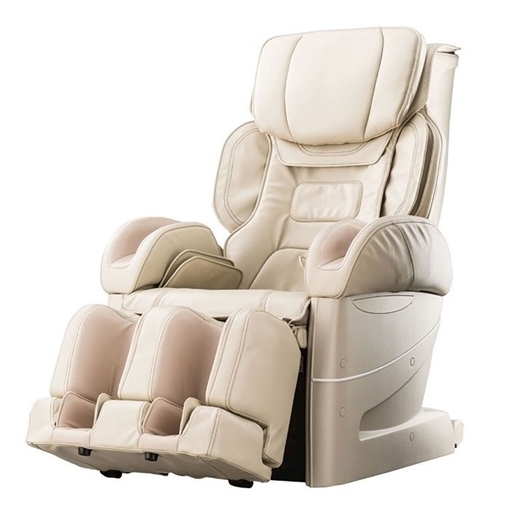 The OS-4D JP Premium is by far the most advanced Osaki massage chair available today. The Kiwami 4D kneading ball massage mechanism has taken 3D massage to the next level. Smarter software controls the speed and intensity of all 3D movements to easily and realistically replicate the massaging movements of the human hand. This technology also allows a lateral motion of the massage heads that helps it get into difficult areas like the muscles between your shoulder blade and your spine. This 4D technology enhances the classic massage modes since it feels more like a person is providing the massage rather than a massage chair. You also have access to new massage techniques, like shoulder blade massage, upper shoulder press massage, and side kneading which we will explain further below. The remote for the Osaki OS-4D JP Premium Massage chair features a full color display with easy access to the automatic massage programs and manual adjustments to the massage chair. Adjust the recline and massage intensity at the push of a button! The new Kiwami Mecha massage mechanism provides the highest level of adjustability of any massage chair we carry. Choose between 12 levels of strength adjustment including the Kiwami mecha mode levels which provides a very strong massage strength. In the automatic massage modes you have 7 levels of adjustability so that you can find your perfect level of massage, but the manual massage modes get access to all 12 from “rubbing mode” all the way up to deep kneading Kiwami mecha mode. Listed below are only a few of the 28 different types of massage techniques. This massage style focuses on the tense muscles between your spine and shoulder blades that carry a lot of tension. The OS-4D JP is able to target this area specifically since its scanning technology can tell it where your shoulder blades are. No more guessing only targeted relief right where you need it. This massage style focuses on the upper shoulder area by pressing down with a kneading massage through the upper shoulder to the base of the neck. This area is where many people hold a lot of their stress. This makes a targeted massage to this area an absolute necessity. Side kneading would not be possible if it were not for the 4D massage mechanism in the OS-4D JP. This massage technique is designed to target the muscles around the shoulder blades and to be used as a wide massage with dynamic movement. This makes it an especially effective in the waist and lower back area. Gripping and stretching motions start at the nape of the neck and move upward toward the base of the skull. This massage helps to improve blood circulation in the neck area as well as relieve stress in these muscles. This variety of massage blends kneading and tapping with up and down movements that create a loop like motion that provides lots of variety in the feeling of this massage technique. Kiwami kneading and tapping is particularly effective at soothing strains, neuralgia, and muscular discomfort in the back and buttock areas, as well as the upper shoulder and trapezius in an effort to relieve tightness. This is a relaxing tapping massage that goes parallel across the shoulder line to provide relief. This massage technique synchronizes massage of the knead ball mechanism and the seat airbags to massage low on the back and parts of the hip that are hard to get to. This is a particularly effective way to sooth lower back pain. This new massage mechanism is designed to improve the kneading massage you receive by being more flexible that the standard quad massage roller. Having a ball instead of a wheel allows the OS-4D JP to move the massage roller in any direction without having to reposition the massage roller. The air magic massage system is the next evolution of the air compression massage system. With new airbag configurations all throughout the massage chair, the entire airbag massage experience has been redesigned. New High Capacity, High Output Airbags – These new airbags are the basis of the Air Magic system and provide a new kind of massage for the whole body. Shoulder Care Massage – 3 new airbag configurations in the shoulder rise up from the backrest and fit the shoulder massage to the user. This makes the shoulder massage much more comfortable for people of all sizes and shapes. The shoulder massage comes with 5 levels of adjustability. Arm Air Massage – The new airbag configuration prevents arms from sliding out and compresses them in a more natural position so it’s more comfortable, and even more relaxing. Waist Air Massage – With 5 levels of adjustability the seat airbags work in concert to provide the different twist combinations that have an incredibly relaxing effect on the lower back. Foot Sole Massage – The airbags in the calves and further down hold the feet down on the “shiatsu balls” outfitted in the sole of the footrest to provide relief to your feet. There are also 5 levels of adjustability to this massage as well. The air cross massage in the Osaki OS-4D JP Premium massage chair uses the waist and hip airbags diagonally to provide a thorough stretching action throughout your entire waist area. The waist and hip airbags inflate on the same side to provide a more gentle stretch to your side and mid-section. This mode can also be used in tandem with the back massage to bring deeper relief to your lower back. Body scanning technology is important to any modern massage chair if it is going to give you a personalized massage of any kind. It's especially important when this technology is combined with the 4d Massage roller. In order for the Osaki OS-4D Pro JP Premium massage chair to utilize the massaging techniques such as side kneading, or upper shoulder press, it has to know exactly where these parts of your back are. With the 3D Point Body Scanning technology, the massage chair finds these locations so that it accurately tailors the massage to you. Located in the bottom of the feet are heating elements that provide a gentle heat therapy to your feet to help them loosen up and gain a deeper benefit from the foot massage. The leg rest is able to extend or retract to cater to various heights and body types. Tall users can gently press their toes into the bottom of the footrest to extend it to a more comfortable distance. The backrest and leg rest are fully automatic and can be moved independently from one another at the push of a button. The chair can recline to about 170 degrees which gives you a wide range to choose from to ensure you are in the perfect position for you.